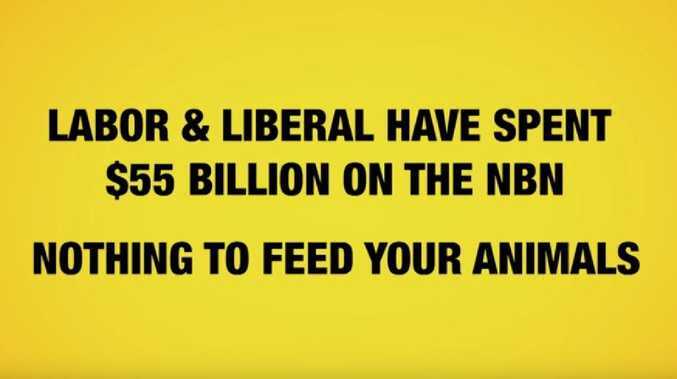 Mr Palmer has claimed spending on the NBN has taken food away from farmers. HE'S been spamming your phone, littering our cities with billboards and clogging TV airwaves with his face for weeks. Now, controversial mining magnate Clive Palmer has revealed the expensive two-minute rant he's been texting you about all day. It's an attack on China. In the ad, the billionaire Queenslander accuses Labor of "allowing the Chinese to undertake a clandestine takeover of Australia" via ports and airports in Western Australia. In a voiceover, the United Australia Party's James McDonald, who organised the ad, says: "At 80km south of Karratha, in the existing Karratha Airport in the Pilbara, the Chinese Communist government-owned companies, with the help of the Labor Party, built and constructed a private jet airport." 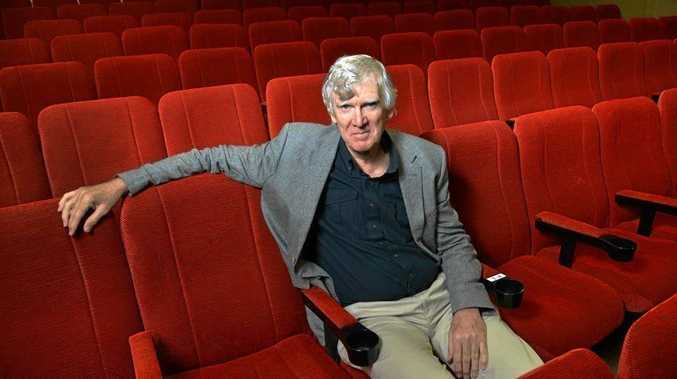 Over another voiceover, retired Royal Australian Airforce squadron leader Martin Brewster then warns that "a superior military airforce could control all of Western Australia's resources in the Pilbara and the north-west shelf gas reserves". McDonald says Australia must now be "concerned" that "Australian politicians are acting in the interests of Chinese Communist Party and not in the interests of Australia". "The Chinese communist government won't allow Australians or any Australian companies to control ports or airports in China. "Why should Bill Shorten or Mark McGowan allow them to control our strategic assets?" Valuable TV time doesn't come cheap, and an advertising expert told news.com.au the mining billionaire would likely have splashed about $132,000 for two minutes of airtime to deliver his mysterious announcement. Mr Palmer teased the announcement yesterday via unsolicited text messages, warning recipients that their "freedom is under threat" and telling them to tune into Channel 9 between 7.20pm and 7.35pm. Mr Palmer has been spending millions of dollars on relentless television advertisements, text message spam, full page newspaper ads, billboards and what one distributor has called a statewide flyer drop across Victoria, in an inescapable ad campaign. Mr Palmer's United Australia Party has issued warnings about submarines, overspending on the National Broadband Network, marijuana and the Greens, and now, the Chinese government intervening on Australian soil. The party delivered double-sided flyers across Victoria yesterday, claiming that West Australian officials had colluded with the Chinese government and endangered the sovereignty of Australia. The letter drop, which the party claimed was "an important message about national security", followed a mass send-out of unsolicited texts yesterday, telling Australians their "freedom is under threat". The party has spent a whopping $1.005 million on TV ads and radio slots in a single month in October, according to figures obtained by The Australian. 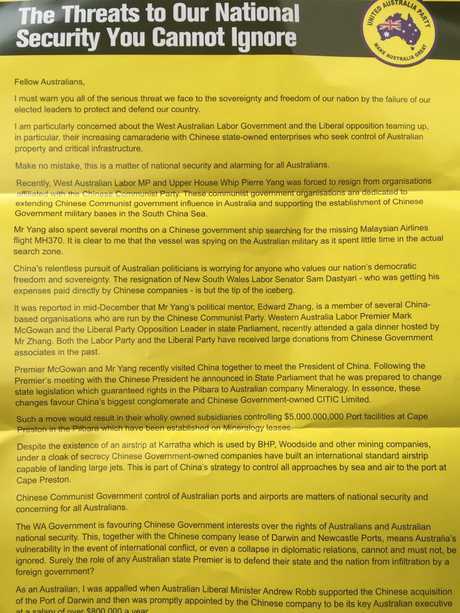 Yesterday's flyer, obtained by news.com.au, makes a number of serious allegations about a Chinese conspiracy to spy on Australian military bases. Signed by Mr Palmer, the letter alleges a ploy aimed at "extending Chinese Communist influence in Australia and supporting the establishment of Chinese military bases in the South China Sea". Mr Palmer then alleges that a Chinese government ship searching for MH370 was actually spying on Australia's military. "It is clear to me the vessel was spying on the Australian military," the flyer reads. "China's relentless pursuit of Australian politicians is worrying for anyone who values our nation's democratic freedom and sovereignty." The flyer alleges Chinese officials are interested in buying Australian ports in an effort to compromise national security. The flyer then spoke about WA Premier Mark McGowan travelling to China to meet with President Xi Jinping. Mr Palmer took aim at complex changes in legislation that affect his own company and its dealings with CITIC, a Chinese company that leases mining land from him in the Pilbara. Mr McGowan has claimed these changes are being made to protect the jobs of more than a thousand Australian workers. Mr Palmer said any changes would "favour China's biggest conglomerate". 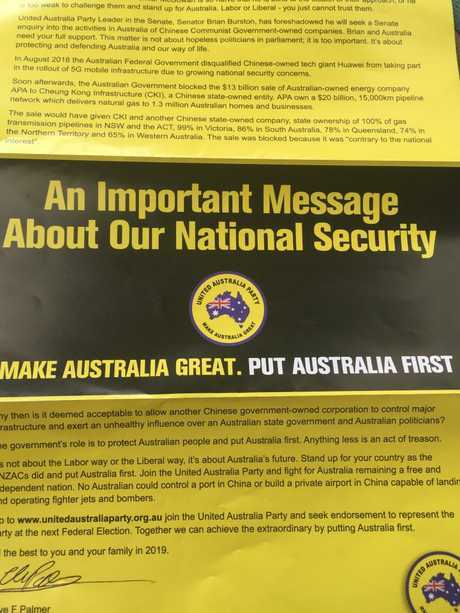 "The WA Government is favouring Chinese Government interests over the rights of Australians and Australian national security," the flyer says. One of the flyer distributors told news.com.au that those delivering the flyers were told to ignore "no junk mail" and "no advertising material" stickers posted on letterboxes. They said the flyers were delivered to "most of Victoria". The distribution company, Salmat Distribution, declined to comment on the number of flyers distributed or the areas canvassed, saying they were bound to protect the privacy of their client. Mr Palmer is in dispute with CITIC as he claims the company hasn't paid the full $500 million fee owed for land clean-up when the lease ends. CITIC argues Mr Palmer's company Mineralogy won't release more land for them to continue to mine. As the legal stoush heats up and thousands are at risk of losing their jobs, the WA Government has threatened to intervene, changing legislation to rule against Mr Palmer. Mr McGowan has claimed his actions are on behalf of the 1500 employees at the CITIC mine. He's referred to Mr Palmer's conduct as "unreasonable". "These workers have every right to be concerned about the behaviour of Mr Clive Palmer and his company Mineralogy," Premier McGowan said in parliament in November. A spokesperson for the Premier declined to comment further. Mr Palmer has moved control of his business to an unoccupied office in New Zealand, telling the media if the WA Government were to intervene, he would be forced to use international laws to "sue the Australian taxpayer" for compensation to the tune of $45 billion. Mr Palmer has been on a relentless multi platform advertising campaign for many months. Many have wondered why Mr Palmer has once again entered into politics, with ABC election analyst Anthony Green saying Palmer has a "nil" per cent chance of winning in the seat of Herbert, where he alienated voters when his nickel mine collapsed and thousands lost their jobs. As Mr Palmer and representatives from the UAP have not responded to news.com.au's requests for comment on this story. CLAIM: "200 million on the drought. Nothing to feed our livestock. Nothing to support our community." FACT CHECK: Government aid, which has come from every level of government, is actually in the billions. The federal government is spending almost $7 billion on drought relief. That's $5 billion for a future drought fund, which delivers $100 million a year for drought resilience. The federal government also delivered more that $1.8 billion in assistance measures and concessional loans to support drought-affected farmers, according to a spokesman for the Department of Agriculture and Water Resources. Additionally, the NSW Government has handed over about $1 billion in drought relief, the most at the state level. This is followed by the Queensland Government, which gave more than $679 million, and the Victorian Government, which has given a total of $5 million, according to recent figures from the ABC. RESULT: False. It's unclear where Mr Palmer got the figure of $200 million. CLAIM: The NBN cost "fifty thousand million dollars"
One of the most popular things Mr Palmer's party has skewered is the National Broadband Network. "Labor and Liberal spent fifty thousand million on the NBN," Mr Palmer says, a figure recently been revised to "fifty five thousand million". Sometimes Mr Palmer will compare this to the amount spent on the drought: "Only $200 million for the farmers!" FACT CHECK: If we quickly skip over the fact that generally most people wouldn't say "fifty thousand million" but would say "fifty billion", Mr Palmer is still off the mark. So the correct amount would be fifty one thousand million. "If you believe Australians should receive that dole and that marijuana should be freely available, vote Greens," Mr Palmer says. 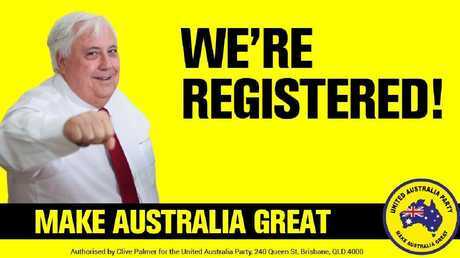 "If you want more jobs, greater opportunity and more bread on the table, vote Palmer United Party. Make Australia Great." FACT CHECK: The Greens do support legalising cannabis, arguing "the war on drugs has failed". They go on to say that 35 per cent of Australians have tried the drug, which could lead to a criminal conviction. The Greens also have an official policy to "raise the rate" of Newstart and Youth Allowance by $75. However the blanket statement of "Australians should receive the dole" suggests the Greens either want all Australians on the dole, or conversely that Mr Palmer could be intending to abolish welfare payments for students, the elderly and Australians on disability payments. RESULT: Correct on the marijuana gibe, but the dole stuff is vague and exaggerated. The flyer makes a number of claims about elected officials in WA.